For the second Art Science Hunger at WORM UBIK Rotterdam we invite artists Lilia Scheerder and Imke Zeinstra and Lucy Cordes Engelman to share their artistic research in relation to the theme. We invite the audience to partake in the conversation. During the evening bites and snacks will be provided. See you there! 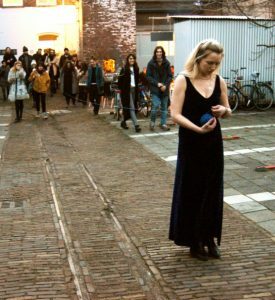 Imke Zeinstra is a performance artist. She issues the aesthetics of female sensuality and eroticism. In her performances she does not shy away from provocation and self-exploitation of her body. Besides being an artist, she was co-founder of Experience in Breda, and organizer of various performance festivals. She is currently working on a text obtaining various questions between her work and the Dutch art scene. During Art Science Hunger she will discuss the aesthetics of lifestyle feminism and activism and the power of the artworld in relation to her work. Lucy Cordes Engelman is interested in embodying a more marginal ethos, one of multiplicity, fragmentation and a refusal towards “world-making” and all that entails (exclusion, capture, and containment). The ongoing practice of Lucy Cordes Engelman is that of a ‘non-narrative’ storyteller working within the landscape of contemporary myths, dreams and sensorial fictions. During Art Science Hunger she will present a segment of her ongoing research into an ethics of feminist cinema, and share a work in progress that deals with her questions in the form of a sensorial fiction. She will also share some of her questions that surround this search for a ‘reclaimed’ cinema that might help us make an embodied move beyond the now and towards a becoming/something else. She is currently obtaining a Master’s of Artistic Research at the Royal Academy of Art in Den Haag and will present a work in progress from her investigation into an ethics of feminist cinema.